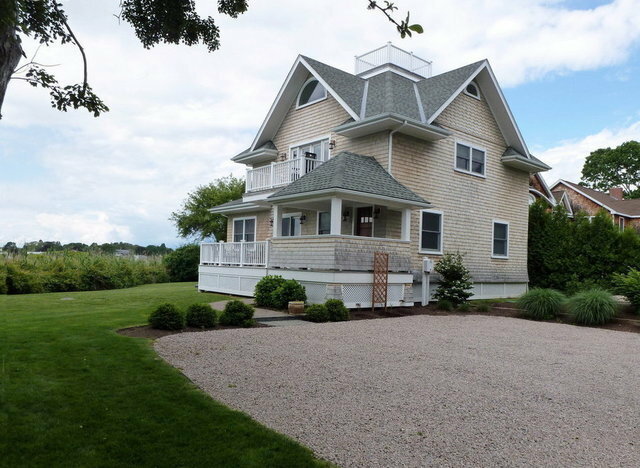 Newly-constructed waterfront cottage marked by impeccable workmanship situated in the seaside village of Watch Hill. Serene views of Colonial Willie Cove can be had from almost every room. Entering the cottage via the deck is the open kitchen and living area complete with a gas fireplace. The bright kitchen is ideal for the discerning cook with the modern amenities of stainless steel appliances, maple cabinetry and granite countertops. Gorgeous hardwood maple flooring is a notable characteristic throughout. There are two bedrooms and a bath on the first floor and a very spacious master bedroom suite on the second level opening to two balconies. The third level is the bonus room boasting a widow's walk.